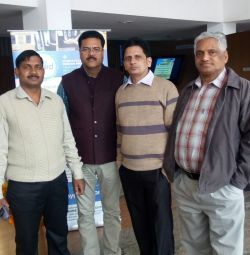 CYTOCHROME Life Sciences & Bioguard has participated in road show exhibiting Bioguard Hygiene products to the Doctors and Scientists at the prestigious Sanjay Gandhi Post Graduate Institute of Medical Sciences [SGPGI] in Lucknow India. The SGPGI is a Super-Speciality teaching and training Medical Institution, situated to the Southeast of Lucknow city. The Institute has 1050 beds, including 146 intensive/high dependency beds. It has 24 operation theatres with state of art facilities. It runs 115 outpatient clinics of different specialties every week. CYTOCHROME Life Sciences was founded with a vision of creating one of the most respectable pharmaceutical companies competing in the Indian & Asean markets. CYTOCHROME Life Sciences has partnered with Bioguard Hygiene UK to sell and distribute Bioguard products in North and Eastern India. The road show exhibited Bioguards products to over 70 Doctors and Scientists within the institute. Our products were well received with many users appreciating the benefits of our alcohol free, user and environmentally friendly products that are effective against high risk organisms. As one visitor commented the products offer a much better alternative to the harsh chemicals currently being used within the institute.